We’ve all experienced a DNF — Did Not Finish — at some point. But more often than not, we’ll set the book aside or mark it DNF on Goodreads, and never speak of it again. It doesn’t necessarily mean it’s a bad book; it’s just not the book for you. You can rant and rave about the writing or plot or characters or overall content — and maybe it truly is bad — but book bashing doesn’t get you anywhere. When I DNF, I mark it on Goodreads, state why it wasn’t for me as short and concise as I can, and let it fade into the background. 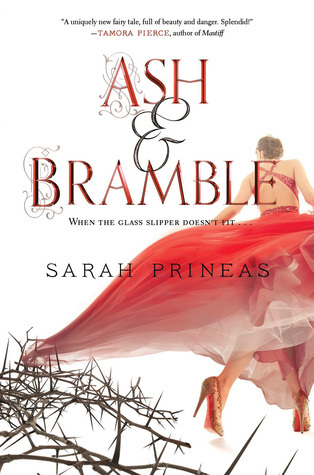 Ash & Bramble by Sarah Prineas is not a bad book. Not at all. That’s not even why I DNF’d. In fact, just about everything I could ever like or want to see was in here in the beginning pages — fairytale spin, intrigue, writing, voice, unique plot, compelling protagonist, and realistic love interest. But if that’s all there, why did I stop? That God-awful subjective gut feeling that creeps up even when I’m agenting: It wasn’t for me. So here I am, promoting a book I did not finish. I was about a third into the book when I stopped. The merits are obvious, and I can see this being a successful book with a loyal following. If there’s any way I can aid in that, I will do so! This book fulfills 1 of 7 #ARCAugust reads. I’ve had this feeling before too. I like that you still did a post promoting it even though it wasn’t for you. I always try to state in a DNF review what I didn’t like, but also the things I think other people will like. That’s all you really can do for a book! I’ve noticed I DNF more and more now, but usually for a good reason. Sometimes books just don’t speak to you the way you hoped, but would be perfect for someone else. Honestly, this is the first DNF where I’ve felt it still needs promotion. All the other books I DNF’d I close the door and move on. Why promote something I didn’t like? But THIS book…wow. Yes. I’ll still push it into people’s hands. How very intriguing! I’ve never had this experience before, mostly because I usually only talk about the books that I feel some sort of personal connection to. But I can see how it could be a possibility! Also, I agree with the merits of Ash & Bramble. While it isn’t necessarily a new favorite for me, I thought it was clever and put an interesting spin on fairy tales!